Daniel Loh: A summary on Commodities play in January! Coffee is hitting a rock? A summary on Commodities play in January! Coffee is hitting a rock? Recently as QE tapering fear is over, there has been a commodities run led by Gold. On the 3rd January, we predicted that Gold has reached a bottom on 3rd January when it is at $1200. Now Gold is $1340. Even though it hits our target of $1320, we continue to believe it has a chance to travel higher. Our second target now is set at $1400, which if reached, we will be looking to really short Gold around $1400-$1450 region. A lot of commodities actually did quite well because of the QE episode. Agricultural commodities like Oil Palm, Coffee, Sugar, Cocoa, Wheat, Corn or Soy Bean all did very well recently. Most of them rebounded off their lows in January or early February. Hence this is the reason why this month local commodities stocks also ran. But the best performing commodities play of them all is COFFEE! 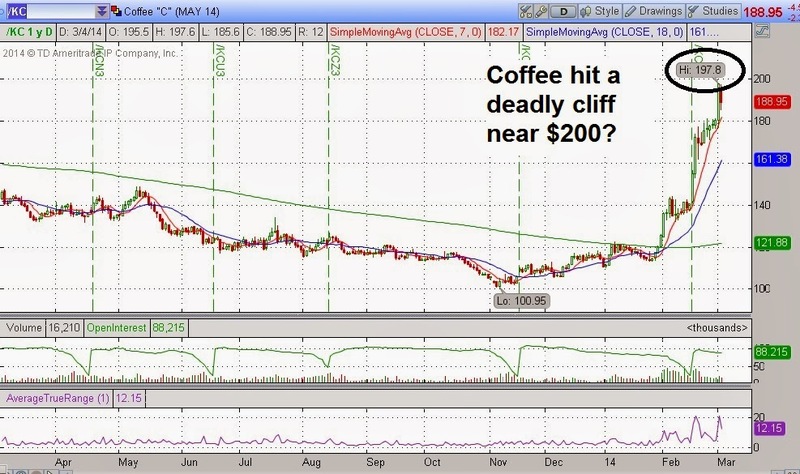 We do think that Coffee may have hit a deadly cliff at $200. And we are looking to short this commodity expecting at least a 15% drop from the peak. Let us see what really happen to coffee these few weeks and if our prediction holds true.